This item is a physical DVD that will be shipped directly to you by The Aware Show. This is a completely new way to look at ADD. Treating all people with ADD the same invites failure and frustration, and can be a disaster, as the traditional treatments that make two of the types of ADD better can make the other 5 types worse. A physical DVD with a running time of 79 minutes. This program is divided into three parts. In Part One, the myths and misconceptions about ADD are discussed, as well as the hallmark ADD symptoms. In Part Two, the 7 different types of ADD are described in detail. And in Part Three Dr and Mrs Amen will give you a clear method for Healing ADD, including the best natural treatments. While they are not opposed to medication, they do think it’s smart to start with lifestyle and natural treatments first. My pre-teen daughter has ADD, and she doesn’t want to participate in any treatment efforts. What can I do? Is ADD affected by a woman’s monthly cycle or menopause? I’d like to have my family try an elimination diet, but don’t know if I can survive without dairy. What do you suggest? My bipolar daughter seems to be doing better while she’s pregnant and off all medication. What should I watch for once the baby is born? My son with ADD loves his video games. I know that’s not good for him, and try to limit his time playing. What do you think is a safe amount? This item contains PDF Downloads that are coming soon to your personal Aware Show account. Nurse Tana Amen’s latest cookbook, Healing ADD through Food on CD-ROM, contains 90 easy, quick, delicious recipes that even picky kids and adults will love. These recipes are designed to boost your brain and your body. A CD-ROM with 90 simple and delicious recipes for increasing focus and attention. ~ Earl R. Henslin, Ph.D.
A long time ago Dr Amen realized that not everyone can get a SPECT scan… so, based on thousands of brain scans, he developed this questionnaire to help educate you and your loved ones about ADD/ADHD and its types. The Healing ADD Brain Type Test is a 70 item self-test, which serves as an information tool to assess the possibility of overall ADD/ADHD syndrome and its seven types. Based on your answers, we will educate you about the type or types of ADD that you may have. Feel free to give this questionnaire to your friends and family members, since ADD runs in families. This item is a physical DVD set that will be shipped directly to you by The Aware Show. This box set includes all 8 public television specials that Dr Amen has given on the subject of the brain. ADD And The Female Brain – The Answers! This item contains PDF Downloads that are immediately available by logging into your personal Aware Show account. Attention Deficit Disorder causes intense unhappiness. Men and women who truly desire a close relationship often find their day-to-day behaviors interfere with the very intimacy they seek. Understanding ADD can provide hope. Dr Amen’s clinical and personal experiences with this disorder uniquely equip him to discuss these issues, and provide a comprehensive guide for couples dealing with ADD in their relationship. This book has the potential to change millions of lives, saving marriages and creating happier, healthier lives for couples and families. Find the help you need to keep your family together in a healthy way that encourages growth instead of turmoil. Daniel G. Amen, M.D., is a double-board certified psychiatrist, brain-imaging expert, and nine-time New York Times bestselling author. Dr Amen is the founder of Amen Clinics, Inc. Amen Clinics has six locations around the United States: Newport Beach and San Francisco, California, Bellevue, Washington, Reston, Virginia, Atlanta and New York City. Amen Clinics have the world’s largest database of functional brain scans relating to the brain and behavior, totaling nearly 100,000 scans on patients from over 111 countries. Dr Amen is a Distinguished Fellow of the American Psychiatric Association, the highest award they give members, and is the lead researcher on the world’s largest brain imaging and rehabilitation study on professional football players. His research has not only demonstrated high levels of brain damage in players, he also showed the possibility of significant recovery for many with the principles that underlie his work. 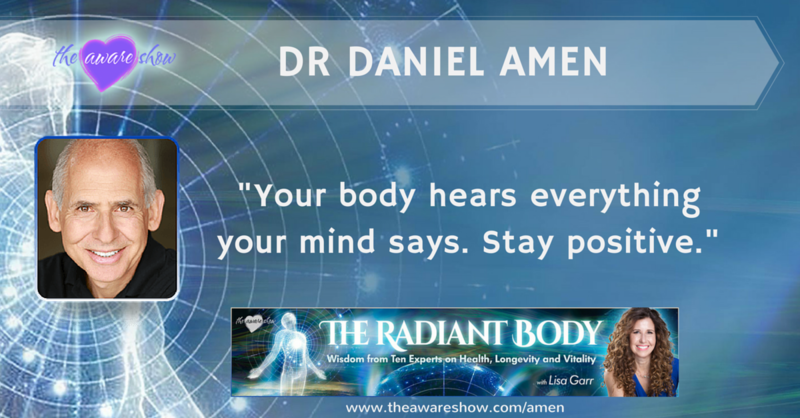 Dr Amen is the author or co-author of 60 professional articles, seven book chapters, and over 30 books, including the #1 New York Times bestseller “The Daniel Plan”. Other bestsellers include “Change Your Brain, Change Your Life”, “Magnificent Mind At Any Age”, “Change Your Brain, Change Your Body” and “Healing ADD”. Dr Amen’s published scientific articles have appeared in these prestigious journals: Molecular Psychiatry, PLOS One, Nature’s Translational Psychiatry, Journal of Neuropsychiatry and Clinical Neuroscience, American Journal of Psychiatry, Nuclear Medicine Communication, Neurological Research, Journal of the American Academy of Child and Adolescent Psychiatry, and Military Medicine. Dr Amen has written, produced and hosted 9 popular shows about the brain that have aired over 70,000 times across North America and have raised more than $52 million dollars for public television. 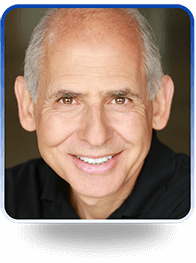 Dr Amen has appeared in movies, including “After the Last Round” and “The Crash Reel,” and has appeared in Emmy winning shows, such as “The Truth About Drinking” and “The Dr Oz Show”. He has also spoken for the National Security Agency (NSA), the National Science Foundation (NSF), Harvard’s Learning and the Brain Conference, the Department of the Interior, the National Council of Juvenile and Family Court Judges and the Supreme Courts of Delaware, Ohio and Wyoming. The Show is currently in progress. Click here to view. The Interview Audio replay is being processed for listening and will be available as soon as possible! and will be available as soon as possible! I understand that if I am not thoroughly convinced that this product is the smartest personal development investment I’ve ever made I can request a refund of the purchase price, excluding shipping charges. Returns, Refunds or Exchanges are not available for: Live Events after the event starts; nutritional supplements; dietary supplements; or any other food, cosmetic or medicinal related products. 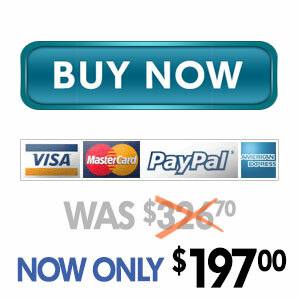 Please review full return/refund policy at https://theawareshow.com/refund. Please note: digital items are available immediately, and physical items will arrive quickly, depending on inventory. 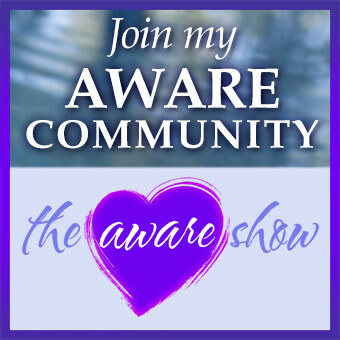 If you have any questions, please contact us at: support@theawareshow.com before making your purchase!